A golden oil that adds flavour to salads and relief to sore muscles. 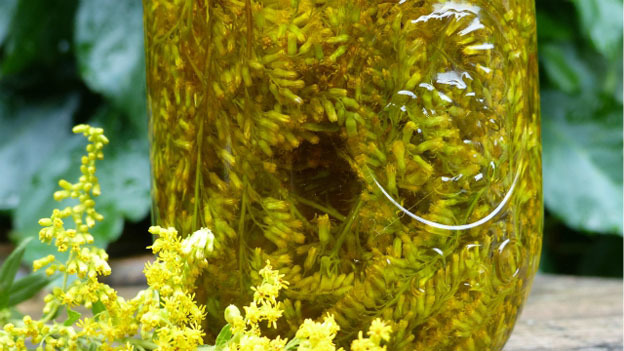 Place as many fresh-picked goldenrod flowers (free of any moisture such as dew) as possible into a sterilized mason jar. Slowly pour enough extra virgin olive oil into the mason jar to thoroughly cover the flowers. Make sure you get all the air bubbles out by poking a skewer into the mixture several times. Seal tight. Allow the mixture to sit for about six weeks so that all the healing properties from the flowers can be absorbed into the oil. After minimum six weeks, strain it through a cheesecloth. Goldenrod oil is used topically for muscle cramps, including uterine cramps. It is also good for sore muscles including neck muscle soreness. Goldenrod essential oil (NOT the homemade version above) is used as an antiseptic and anti-inflammatory ointment. Good for the circulatory system, a massage with goldenrod essential oil works well for various aches and pains. The oil is also good for the skin, and is effective in healing various skin conditions.